If you’re thinking about returning to school, or even if you’ve already made the decision to go back, I’m sure you're thinking about money, and how you'll finance your education. At Peirce, we’re experts in helping adult learners navigate this investment. One way adult students can take some of the financial anxiety out of going back to school is to practice good financial habits across the board. On Peirce Connections, we’ve been exploring practical tips that adult learners can apply to their finances in order to be financially healthy and minimize their anxiety. Be honest with yourself about where and how you currently spend money. If you’re not truthful with yourself about the current state of your finances, you’ll be starting from a false data point and creating an unrealistic budget. A good first step to creating a personal budget is to keep track of every penny you spend for 30 days. Work to limit discretionary spending. The practice of saving money starts with identifying what you need, versus what you want. When you look at your 30 day spending track record, categorize what you’ve been spending money on that you absolutely need (utilities, housing expenses, groceries) versus items that you want (buying coffee on the way to the train every morning, concert tickets, a new purse). Pinpoint opportunities for channeling some of that discretionary spending into savings instead. Include a plan for spending money on things that you want. If you create a budget that’s based only around the necessities, chances are you’ll have a hard time sticking to it, and end up splurging on things you want. Instead of treating yourself erratically, plan ahead to use a small portion of your funds on something you want. Use whatever tool works best for you. Paper and pencil, a Google spreadsheet, or an online app like mint.com; your options for developing a personal budget are endless! Experiment and find the platform that you are most comfortable with. Your system won’t work if you’re not at ease with the tools you’re using. Review your budget periodically to make sure it still reflects your needs. 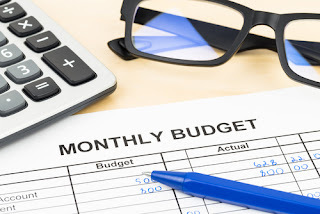 As your lifestyle and circumstances change, so will your budget. For instance, the budget you need to live within while working to achieve your degree may be very different than the budget you’ll be able to afford once you’ve earned your degree, and perhaps along with it, a promotion at work! Make sure you’re reviewing your budget on a regular basis to ensure that it’s still a good fit for your current circumstances. For our entire Finances Matter: Practical Financial Tips for Adult Learners presentation, click here. To learn more about how you can finance your education, and get the degree you need for the career you deserve, click here.